Fall is in full swing around here and I am LOVING it. Last weekend I baked a new fall cookie recipe, we put out our fall decor, I’m living in flannel and our fireplace is constantly on! Definitely my most favorite time of year (probably tied with Christmas). To get us all in the mood for fall (in case you’re not there already!) I wanted to share some of my current fall favorite things with y’all! Everything from home decor and clothes to the cookie recipe I baked last weekend! Click on any image in the collage below to shop! If you don’t have this amazing pumpkin candle yet, RUN, don’t walk, and buy at least 3 of them for your house or to give as gifts! We have lots of fall candles in our house but this one is my absolute favorite. I pretty much have it burning 24/7. This copper one also smells amazing and looks adorable on a bar cart or coffee table tray! A good pair of leopard flats is so essential for your fall wardrobe. They make a statement, but they’re neutral enough to pair with just about everything. I love this pair because they are SO comfortable and they instantly make a black skinny jean + tshirt outfit instantly chic! Y’all know what a sucker I am for a good pair of denim (at least, when I’m not pregnant haha). This is one of my all time favorite pair of dark distressed jeans. They are super comfortable and so flattering! They’re also the perfect ankle length which can be tough to find! They are adorable with OTK boots, booties, or flats! I promise, you will get SO much use out of these jeans year round. And the quality is great so you’ll wear them year after year. This adorable pom pom beanie from Sole Society is so perfect for colder days! It’s under $30 and comes in three colors. I love how soft and warm it is, too! I also recently got these OTK grey boots and have been wearing them on repeat. I always think it’s so hard to find the right shade of grey boots, and these ones are honestly perfect! They’re much more budget-friendly than a lot of OTK boots, and they’re so flattering! 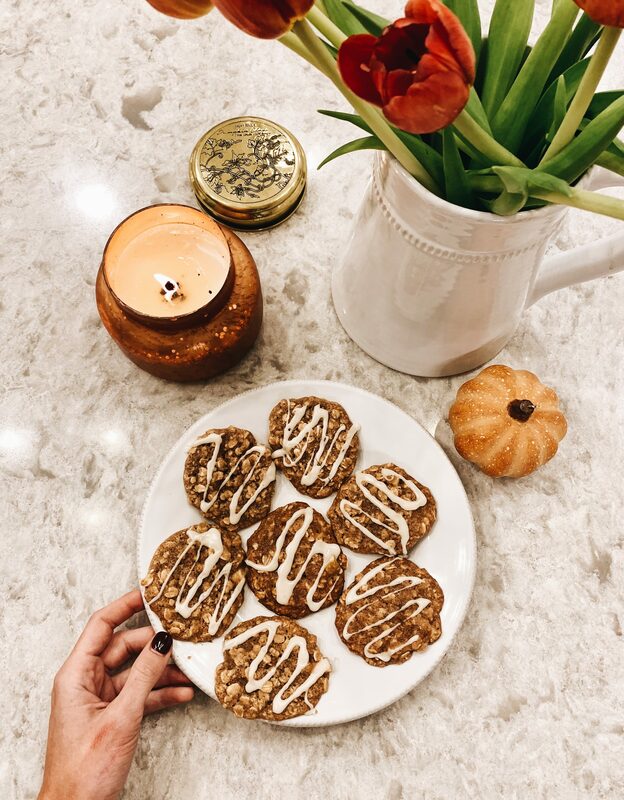 Last weekend when I baked these apple cinnamon oatmeal cookies, I got SO many DM’s requesting the recipe! So I’m linking it here for everyone who asked! I have to say…they were actually better on day 2 (and 3 and 4 haha) after they sat in the refrigerator for a while! I’ve never put cookies in the fridge before, but trust me…these cookies get better with time! They’re still great though right when they come out of the oven! They were also pretty easy to bake which is always a plus! Thanks for reading friends! Hope your week is off to a great start! If only it were cold enough in CA for these clothes! I still have to wait another month. Love the collage. aw hopefully it cools down soon! thanks carly! I love all of these fall picks! It’s finally cooled off here and I’m loving pulling out all the cozy things! isn’t it the best time of year?! thanks for reading, emily!